Do you stress over Christmas decorations? Have you ever wondered if all the work was worth the effort? We certainly did. Getting the decorations out of storage, finding the hours to put them up, rearranging the other stuff to make room for them, putting the storage bins away again, and then repeating the entire process several weeks later was not something we enjoyed. And then there was the timing! Before or after Thanksgiving to put them up? Before or after New Year's to take them down? When I (Jeri) was working full-time, it was even more stressful, because we knew that my time at home was limited and that once the vacation was over, finding the time to put everything away was challenging. We loved having the house decorated, but over time, the process became less and less enjoyable. How could preparing for one of our favorite times of the year bring us so little joy? And then this year happened. And we found the joy in Christmas decorating again. Six months ago, we decided it was time to downsize and simplify our lives. It was time to sell our large home and lot, which meant we had to get the house ready to look its best for showings. From long experience, we knew that the homes that looked their best and roomiest were those with no clutter and few furnishings. To complicate the process, our home also included a large detached garage - about 3000 sq ft - which was filled with all kinds of stuff, much of which we didn’t have organized very well. So we decided that the downsize part of the decision had to include purging our lives and home of the stuff that was superfluous. Both to help everything show better, but also to simplify our lives. We'll go into more detail about the actual purge in later posts, but be assured that once the purging bug bit us, it was surprisingly easy to start clearing all the extra stuff out of our lives. We spent about six weeks going through boxes, closets, drawers and rooms sorting and piling stuff that was taken to thrift stores, the dump or given away. We held two garage sales that funded the many trips we took to clear the stuff away. Jeri happily cleared away the holiday closet. Holiday decorations can be such a challenge! Almost every client of ours considered where to store the holiday decorations when looking for a home. We had a closet and several huge bins of decorations that we had gathered over the years. The surprise was that as much as we loved many of those decorations, it was so easy and took such a weight off our minds when we gave them all away. And, we gained an entire empty closet! The prized things we kept fit on one shelf in a couple of boxes. It was great! We both believed that we would be moved before Christmas, so it took me (Jeri) by surprise one night in early December when I realized that we were still in our big house and that we had no plans, and maybe no things, to decorate with for Christmas. And then I started wondering what I had kept. Several months and lots of adventures later, I had no idea! 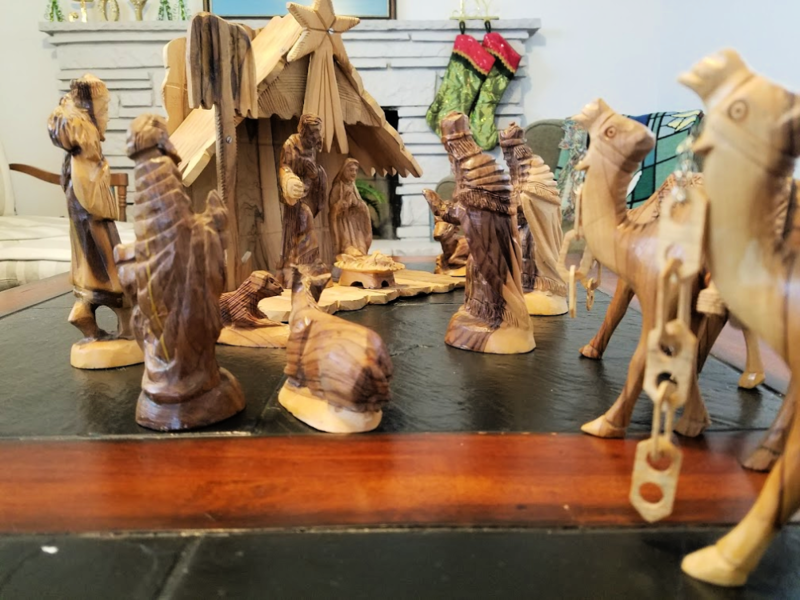 Before we ever met, Don's parents went on a tour to the Holy Land where they bought olive wood crèches for each of their children, including Don. It was the first Christmas decoration we had as a couple and something we treasured. Surely, I didn’t purge that crèche, but I had only vague memories of what I might have done with it. It was time to find out what was in the boxes on the closet shelf. I found one box with a few cherished ornaments and our Christmas stockings - that was a surprise. But no creche. Finally, after searching a bit, I was flooded with relief and joy to see the box in which I stored the olive-wood crèche. I gratefully held those small figures in my hands and thought about their role in all of our past Christmases. Within a few minutes they were set up in a place of honor. They and the stockings, are the only Christmas decorations in the house. And yet, their simplicity fills the house with the Christmas spirit. 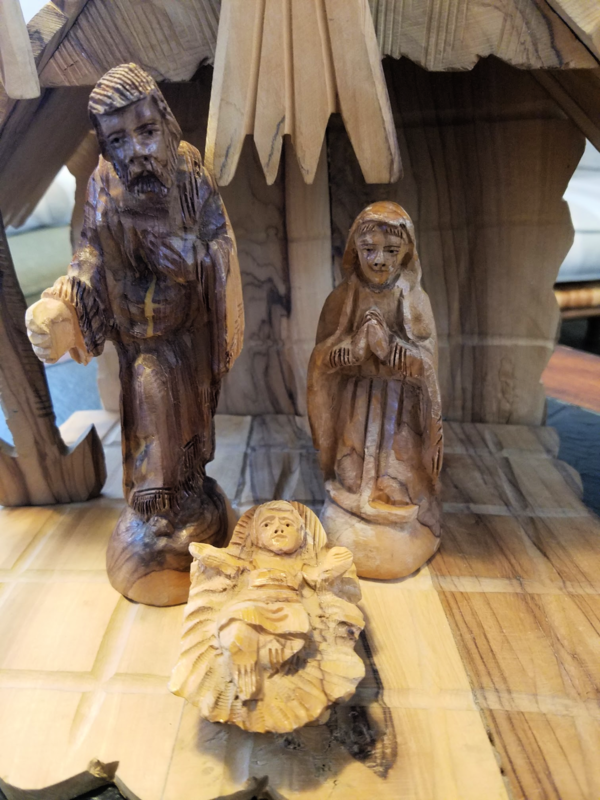 We realized that as lovely as all those other decorations were, these simple figures are really the only ones needed to help us celebrate our Savior’s birth. We will never stress over Christmas decorating again. Instead, we will look forward to unwrapping each sweet piece and reflecting about that first Christmas night where the decorations were simple, but the blessings were profound. Clearing out all the extra stuff helped us find real joy in Christmas again. We wish all of you a sweet and joyful Christmas season, no matter how you decorate for it.